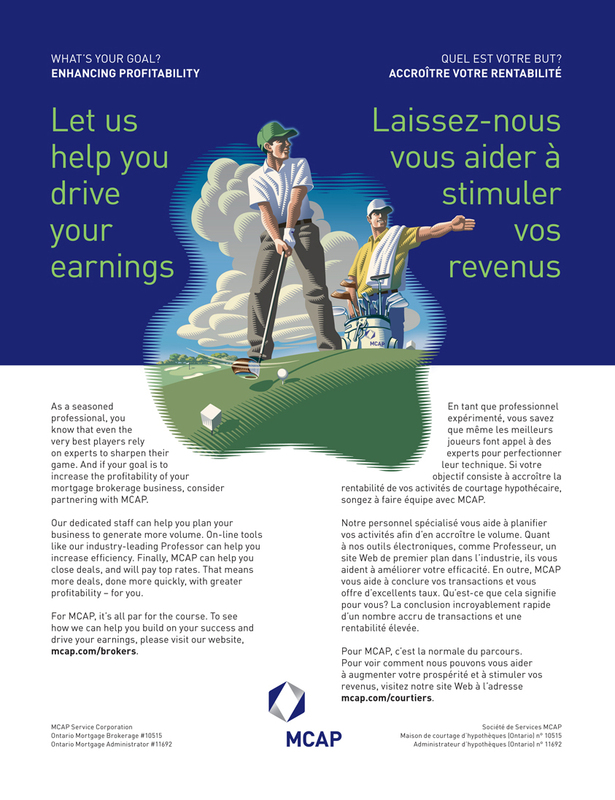 Gary discusses a recent project he worked on with Michael Stokely for a campaign for "MCAP Service Corporation", one of Canada's leading independent mortgage financing companies: "The illustrations were to be based on sports metaphors. The challenge here was that the client wanted to keep their former ad format--a full page divided into 2 panels: a dark blue panel (their corporate colour) and a white panel. The illustration was to take up portions of both panels as well as rag around the bilingual headline and body copy. As the work progressed the copy was being written, laid out and edited at the same time. It was kind of like designing with a moving target. The client also requested that the illustrations be able to exist on a completely white background to accommodate future usage. All this said, luckily the designer, Michael Stokely, really understood the challenges and was very helpful in the collaboration."